Today two Minnesota Vikings legends (one past, one present), will look to be etched into National Football League history. Running back Adrian Peterson is looking to win the AP NFL MVP award and former Vikings wide receiver Cris Carter is looking to punch his ticket to the Pro Football Hall of Fame in Canton, Ohio. These players are the definition of superstars in Minnesota Vikings history. Adrian Peterson recorded an MVP caliber season with 2,097 yards, just nine yards short of Eric Dickerson's single season rushing record. Peterson recorded all of his accolades despite a torn ACL, MCL, and PCL he suffered in December of 2011. He only missed the season finale and took the field on September 9th for the Vikings home opener vs. Jacksonville. Peterson set an entirely new standard for athletes recovering from serious knee injuries. He is an active member in the Vikings community and is a key veteran in the locker room. He not only had a great season in 2012, but is arguably the best player in NFL history and is the best player in Minnesota Vikings history. We have compiled statistics to prove that we are truly watching history in front of our eyes. Below are the records and statistics Adrian Peterson had already accomplished in 6 seasons in the NFL. These records are unprecedented and have rarely been seen in NFL history. 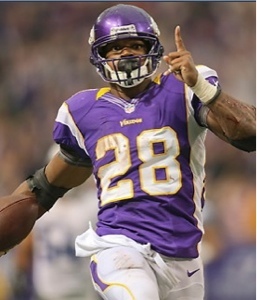 Peterson has proven that he is not only the 2012-13 AP NFL MVP, but arguably is becoming the greatest of all time. As Vikings fans, we know he is the greatest Viking of all time on the field, off the field, and in our minds, no matter the outcome of awards and records. Meanwhile, former Vikings wide receiver Cris Carter is working to stamp his ticket to the Pro Football Hall of Fame. Carter is one of the Vikings all-time greatest receivers and started his career for the Eagles (1987-89). 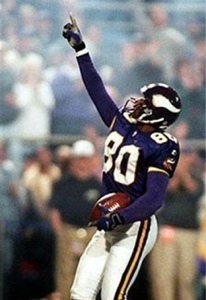 He then joined the Vikings and recorded 11 seasons, while piling up major statistics (1990-2001). To close out his career, he joined the Dolphins for one final season (2002). His career statistics are some of the best in NFL history. He recorded more than 1,000 receiving yards in eight consecutive seasons. Set the then-NFL record with 122 catches in 1994. Was ranked second in receptions (1,101) and receiving TDs (130) when he retired in 2002. He also was named to the Pro Bowl eight times in his 16 year NFL career. Carter was first placed on the ballot in 2008, but hasn't been selected to the Hall of Fame. He certainly has proven himself on the field, but hasn't handled his emotions in the greatest way. In 2001, he displayed his lowest production in his career and decided to execute the opt out clause in his contract. This was interpreted to the media in a poor way. People always remember the way Carter left the organization rather than the impact he made in 11 seasons with the Vikings. In addition, he went to the media after he wasn't selected to express his distaste for not being voted in. Many voters felt he was being selfish, but ultimately you have to believe that career statistics and records will overshadow these types of issues. In the space below, we have provided a summary of the records and achievements Carter accomplished in his 16 year career. If these statistics aren't enough for Cris Carter to be enshrined in the Pro Football Hall of Fame, then the voters aren't reading the details of his NFL career. I understand the somewhat odd way he ended his career in Minnesota, but the accolades he has accomplished are deserving enough to be placed with some of the greatest to ever play. To check out the Pro Football Hall of Fame Selection Show, tune into NFL Network at 4:30 p.m.cst. For the AP NFL MVP award, tune into CBS at 8:00 p.m.cst for the NFL Honors show.